Put julienned cabbage in a large bowl. Add salt and, with clean hands, mix and squeeze very well until it starts to let out some water. Let this sit in the bowl while you food process or hand chop all the other ingredients, except the fish sauce. Add all ingredients to cabbage and mix well. 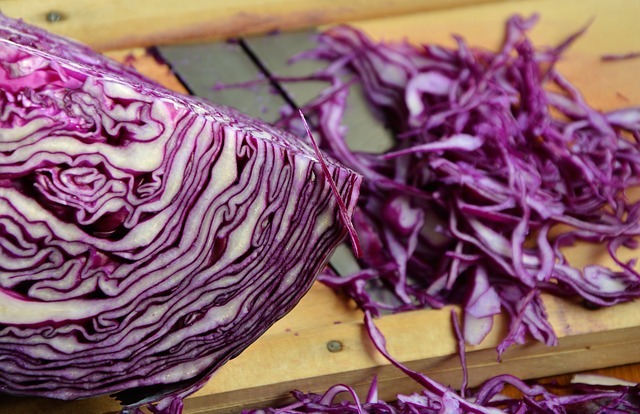 Transfer cabbage mixture to your container. Add water just to cover, leaving some room at the top. Cover top with plastic wrap and secure well with a few tightly fitting rubber bands. Set the kimchi in a place in your house that does not regularly get above 72° and place your thermometer nearby. If the temp goes 72° for more than about 3 hours, you need to move it to somewhere cooler. Kimchi will ferment below 65° but it will just take longer. Just let it sit and in about 2 or 3 days, depending on the temperature, you should notice the plastic wrap starting to bulge also, you should notice a distinct aroma. Every day or so you can slowly tip the jar upside down to distribute the solids and get everything all worked up and to speed up fermentation. After a week or so, the plastic wrap should be flat- not bulging anymore which indicates that it should be pretty much finished. Once it is flat, you should taste the liquid and if it has a tremendous and sour flavor, Then- you have done it! Now just put the actual lids on the jars it and refrigerate. What to do with Kimchi. Put on the side of stir fry noodles or rice * Add to soups * Drain liquid and put on a sandwich- in place of sauerkraut, marinated grilled sliced pork or chicken, or shrimp toasty baguette * Use the liquid for finishing dishes * Some people just eat it on the side * It’s good stirred in roasted or sautéed potatoes * Kimchi fries: Make a little mayonnaise, sour cream, lemon or lime dressing. Heat the kimchi and put over hot French fries, finish with the dressing and cilantro.